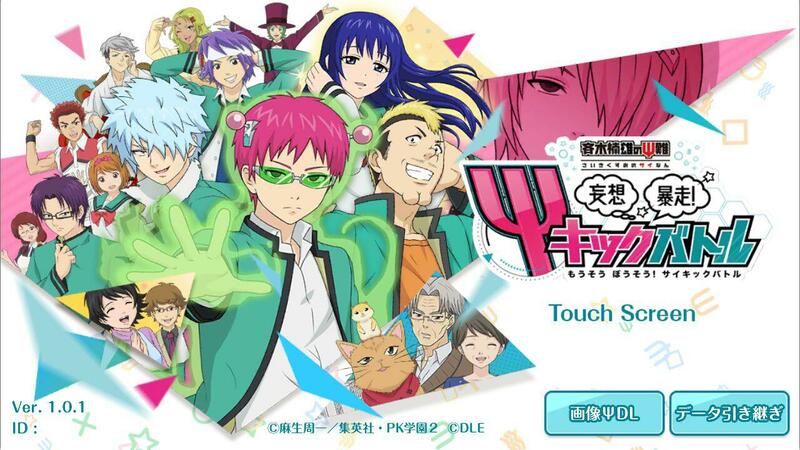 「Mobage」Saiki Kusuo no Ψ-nan Mousou Bousou! Psychic Battle! As the name would suggest, this is yet another mobile game review! This game is based on the world of Saiki Kusuo no Ψ-nan, otherwise known as "The Disastrous Life of Saiki K" and is developed by Dream Link Entertainment (DLE). 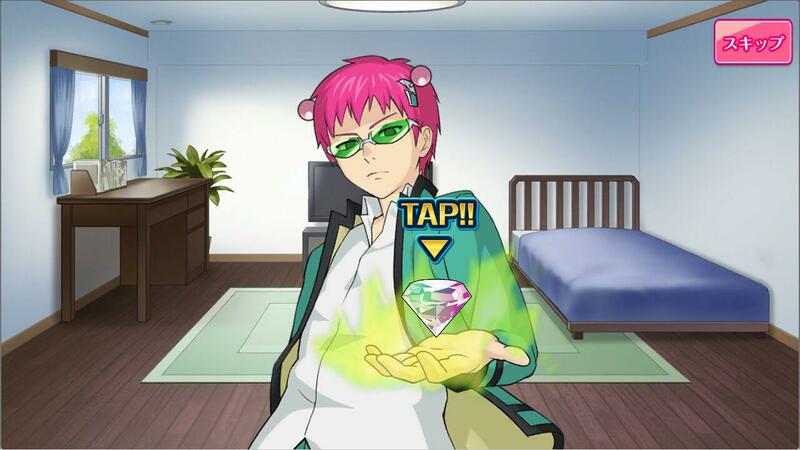 When it comes to mobage with a gacha system, we players have several requirements. First, the art and how authentic the art-style and story is to the show (because we are all fans of the show! ), how fun the actual gameplay is (it's a game after all), and of course, how rigged the gacha system could be. But before we move on to shoving financial sacrifices to our lord and savior, RNGesus, let's first take a step back to look at several aspects of the game itself. 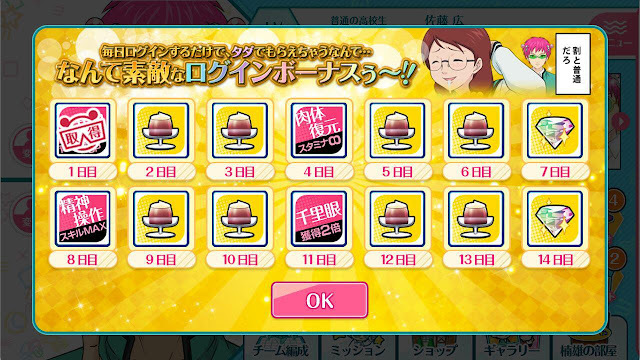 Most, if not all, mobage nowadays has its own login bonus as a way to entice players into logging in daily so they don't "miss out". 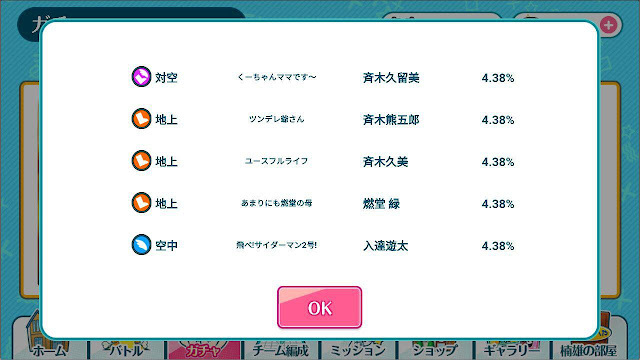 This is even more important for a new game like this, so let's take a look at what the two different login bonuses now. 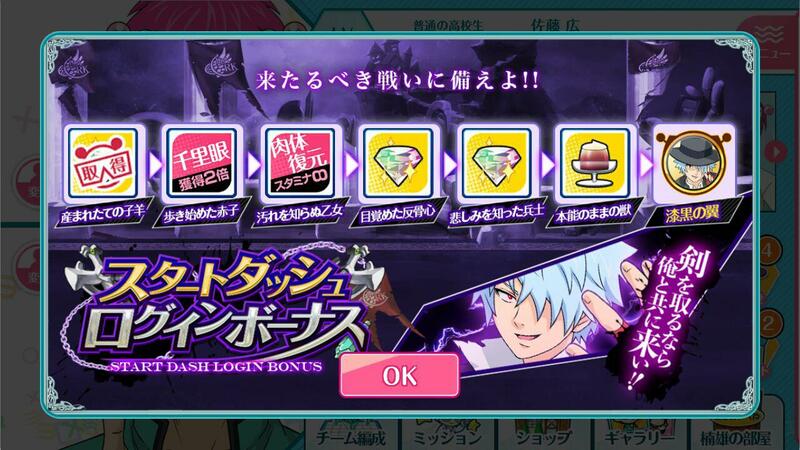 The first is a special one "START DASH LOGIN BONUS" where they thank new users for picking up the game, entice them with a SR Kaidou (Day 7) and make a DASH for their banks. 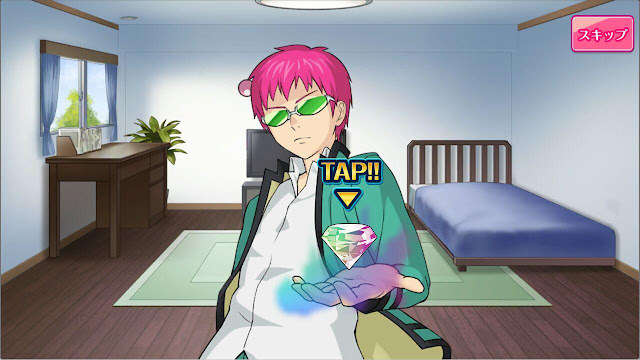 Jokes aside, the second image is the normal login bonus where you get these pink "power-ups", coffee-jelly (for exchanging items in the store) and of course, diamonds (for the sacrificial gacha). Not too... shabby, I suppose. Starting the game now also gives 450 free diamonds (for a free 10-roll). 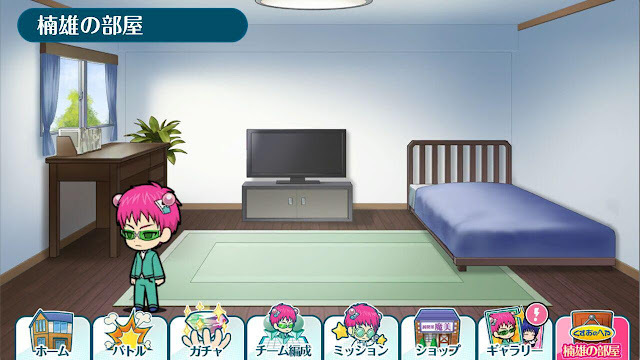 This is awesome and very convenient for rerollers so if you like to do that, or just want to have a free gacha to try your hand at, here's your solution! I firmly believe that mobage and stories come hand in hand, and this game is lacking slightly in this aspect. First, there doesn't seem to be an "auto" or "skip" function, and the story isn't voiced. At all. All these seem to scream about the game being possibly low(er) budget, but considering the gag-style source material, I'm not too surprised. 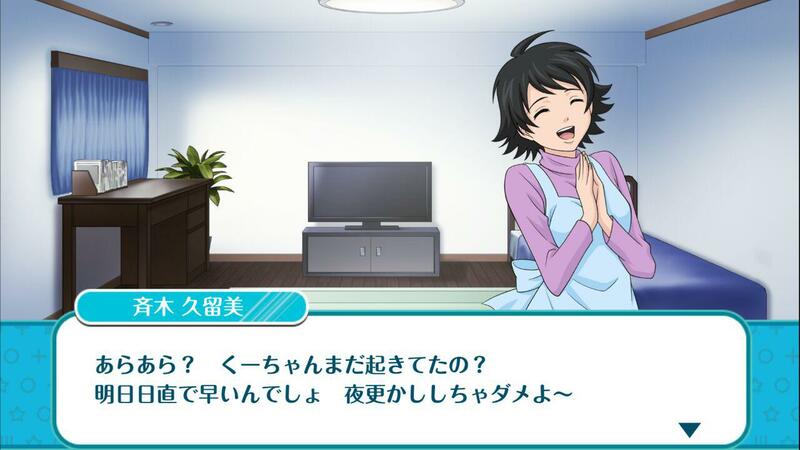 The humorous side of the anime is still present in the game (if you bother reading). The visuals are easy on the eye—not bad but certainly not fabulous either. In fact, it's reminiscent of the anime and I do feel that it ties in well enough to be an extension of the anime. 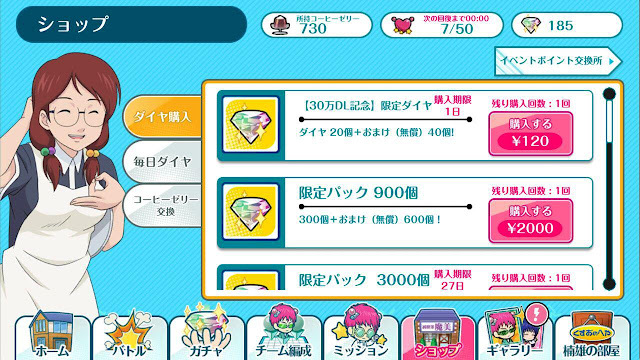 This game uses a node-style stage where you have 10 stages per page. After clearing them all at least once, you can then move on to the next page. After clearing each stage, you will get a rank—Gold (Stages 11-12), Silver (Stage 13) and henceforth. 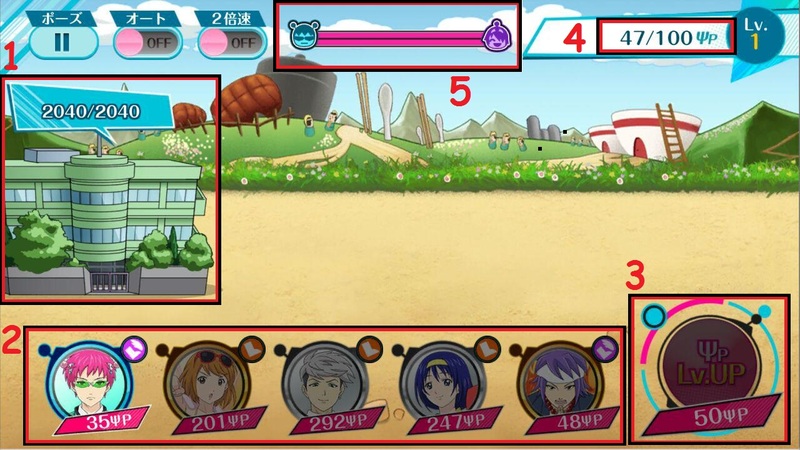 The first play of a node takes 1 stamina (top right heart-shaped icon at 17/50) and a re-play of a stage takes 10 stamina up until stage 12. 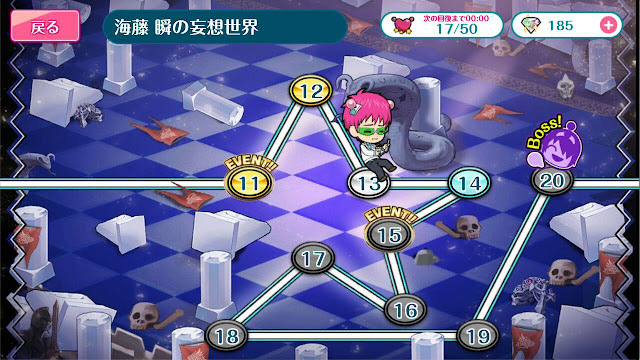 Stages marked with "Event!!" comes with a short story before the battle so if you are a big fan of the series, make sure to keep an eye out for those! Gameplay isn't difficult at all and there are basically only 5 main things you have to take note of. 1. You have a base which you'll have to protect and it comes with a health bar. The enemy will have a base that's directly opposite yours and they will be sending out minions to destroy your base. 2. These are you tiny little minions. Send them out to protect your base as well as destroy the enemy's base. They will engage the opponent's minions in a heated battle if they meet along the way! 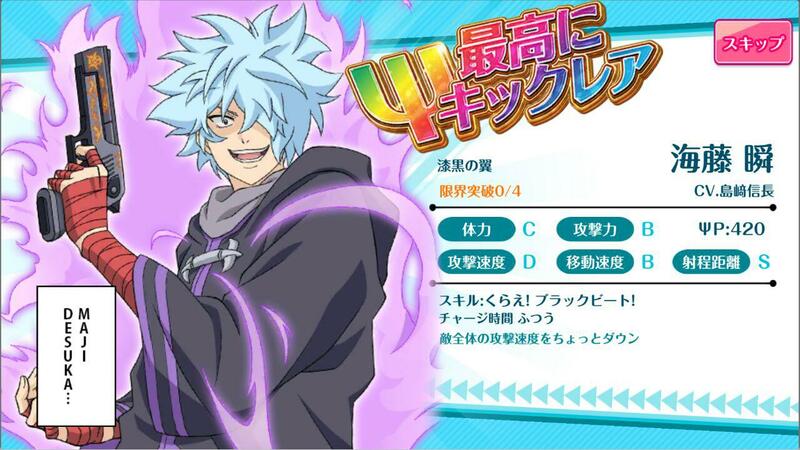 Each minion also comes with their own skill, such as increase in attack or health recovery, etc. Sending each minion out costs Ψ points, for instance 35ΨP for 1 Saiki Kusuo. 3. This is your wallet. Leveling up your wallet would allow you to gain more ΨP per second as well as increase the maximum amount of ΨP you can hoard. 4. This is the amount of ΨP you currently have. The limit is 100ΨP and I currently have 47. As mentioned in (3), leveling up the wallet will increase the limit above 100ΨP. 5. This is the map. The left end (in blue) is your base while the right end (in purple) is the enemy's base. In this game, there are two tracks, a "ground" and a "flying" track, hence the two rows on the map between the bases. Your progress to the enemy's base will remain as blue whereas the enemy's progress to your base will be marked in purple. The site of battle will be marked with a yellow collision. This map function is incredibly handy as you are unable to zoom out. Here's an actual battle so you can decipher the five points which I've just mentioned! In addition, at the top left corner, there's a pause button as well as Auto and 2x Speed. 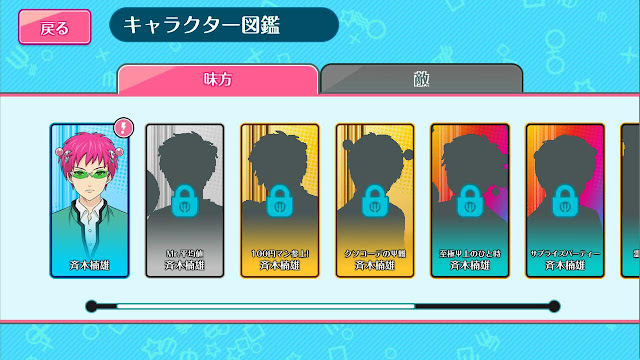 Something I like about this game is how they put all the cards you don't currently own as silhouettes in the member's list, with the backgrounds of the cards being the deciding factor for the different rarities. The list is then further divided by character for easy sorting. This definitely makes life much easier if you are collecting every card of a character and you want to find what you're missing. Furthermore, there is also a seal-exchange shop going on in this game, where you use coffee jellies to exchange (brown thing at top-center) for items. 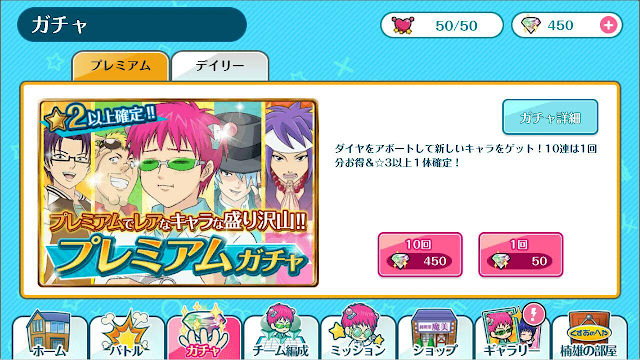 You can get cards from 2* to 4* (highest rarity) for a ridiculous number of jellies. As it is also mentioned that these cards are limited to April, there might be a rotation for other cards as well. 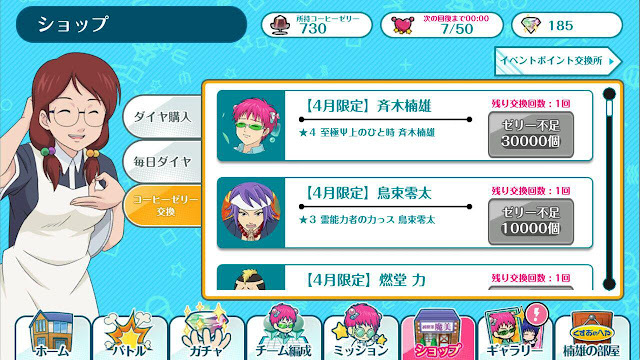 You can also change other things such as these pink "skills" for use in battle, or "titles" for your profile page! Gacha is the reprieve of our tainted souls and RNG-less bodies. 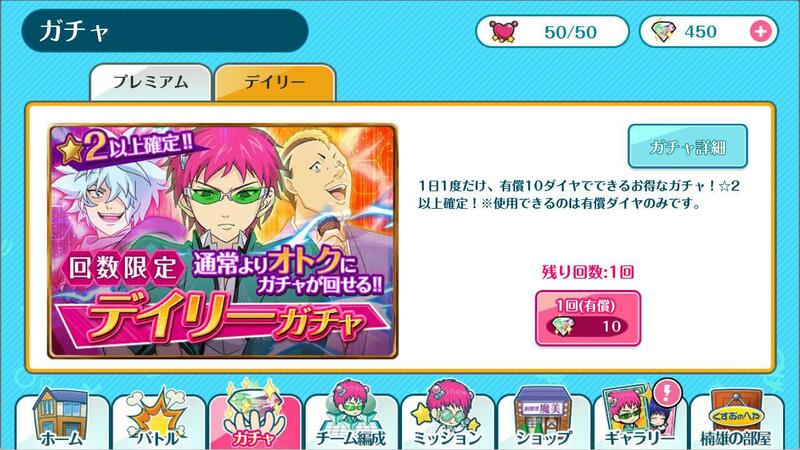 And of course, this mobage comes with a gacha system as well! All cards in the pool are at least 2* (rares, duh) and doing a 10-roll guarantees at least one 3* (SR). 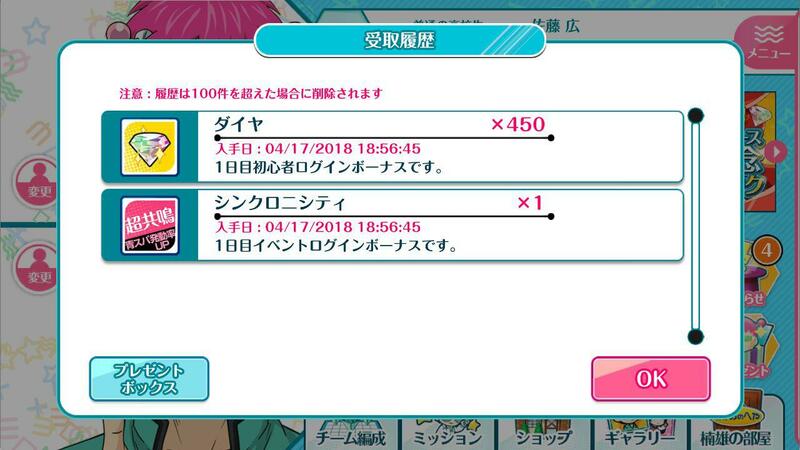 A soloyolo is 50 diamonds and doing 10-roll at 450 diamonds is technically a 9+1 and definitely much more worth it. 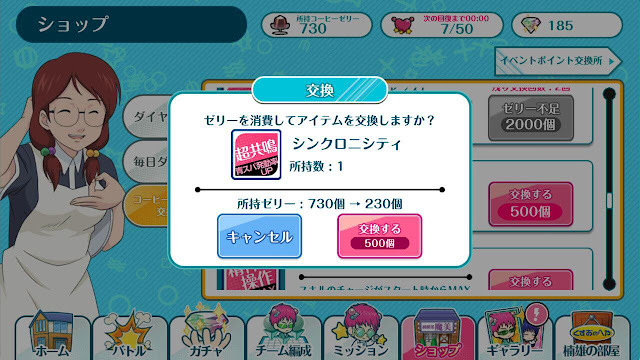 A discounted daily scout is also available on the second tab, going at 10 diamonds for a soloyolo instead of 50. Well, the rates are as stated in the image above. 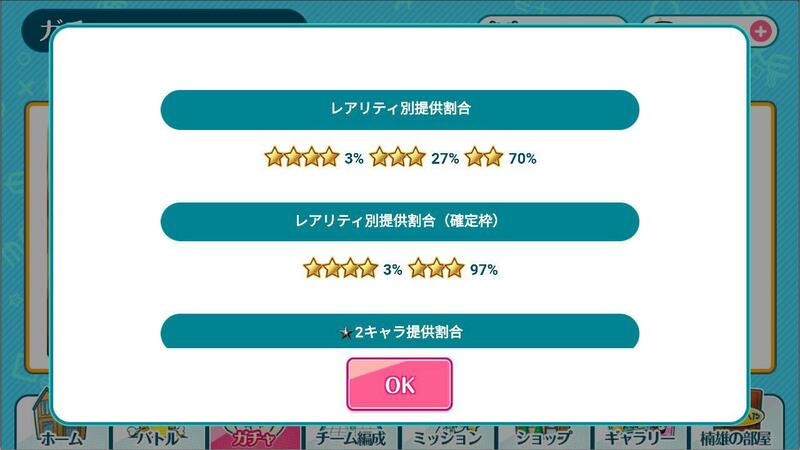 For the first nine cards, 3% for a 4* and 27% for a 3%. The last card is always 3*+ guaranteed at 97% chance for a 3*. There are three different types of cards currently—purple, orange and blue. Purple cards are land-based but have attacks that can affect both orange (land) and blue (sky/flying) types by whacking the blues back onto land. Orange cards are land-based and their attacks only work on land as well. Blue cards are those that can fly and hence if there are no "flying" opponents as well, you can just fly straight to the enemy's base and destroy it. Of course, the opposite is also true. As with most games, you can tell if you will be getting a 4* card before the cards themselves appear. 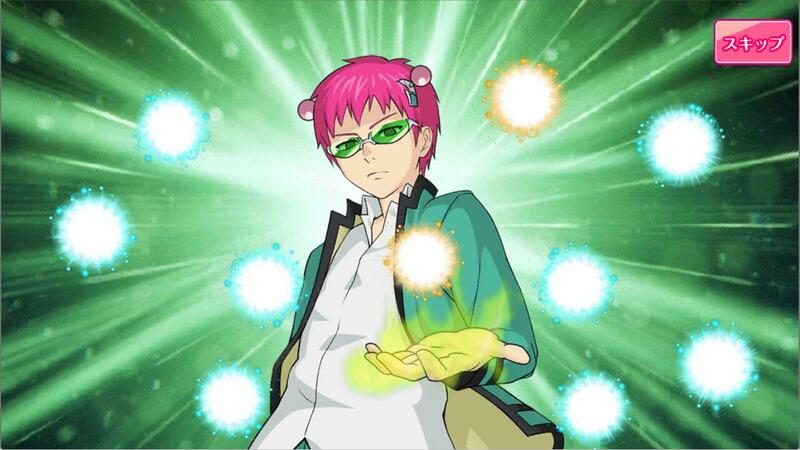 The fire around Saiki's hand is green, hence, there is no 4*. I'm still unsure if flips happen in this game. 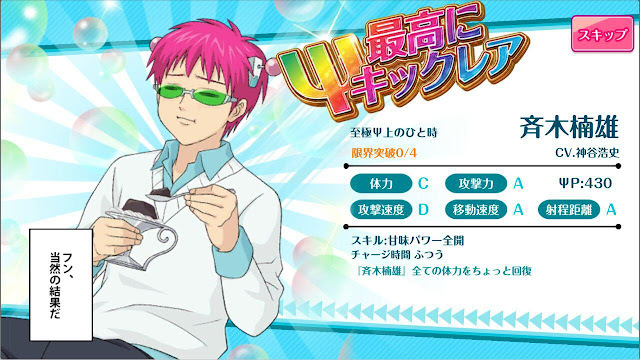 If there is a 4* in the pool, you will see a short animation of Saiki removing one of the limiter devices on his head (hence he is missing his left one in the image above), and the flame around the diamond will be rainbow-colored. Furthermore, 3* cards are lined in this orange light while 2* cards are lined in blue. 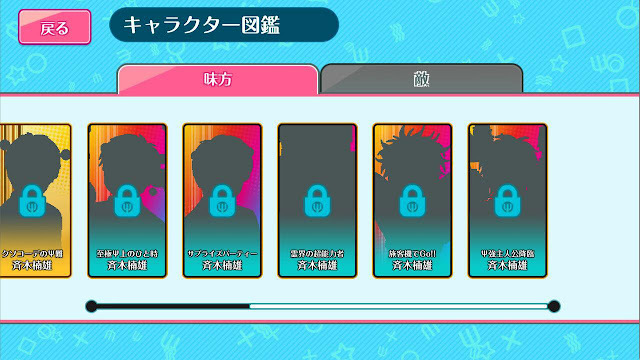 Rainbow lights are obviously 4* cards. It's so easy to tell! 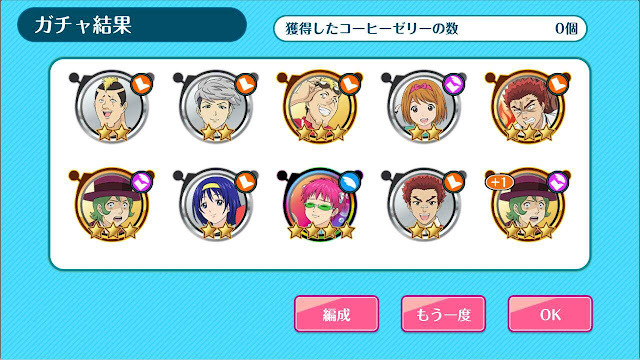 Dupes are marked as +1 and added to the card's stats. 4* cards come with a better illustration though still nothing fantastic. That being said, they are ridiculously strong in battle so if you don't mind rerolling, starting with a 4* should be optimal! This is a legit topic for whales or people who might be enticed to spend a little in the future. 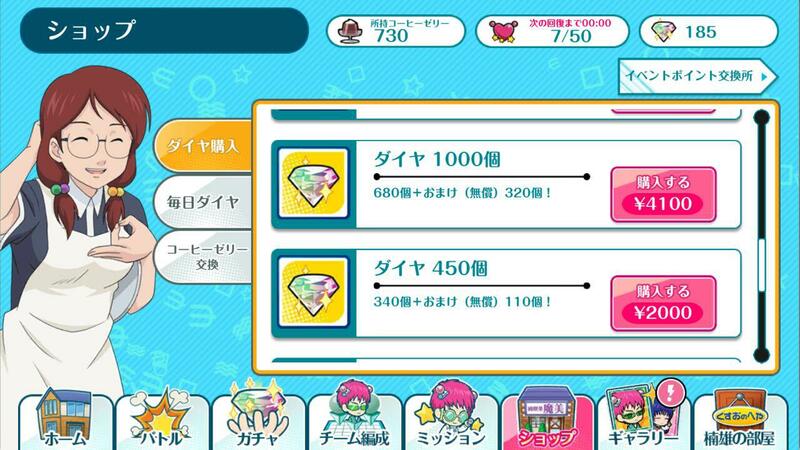 I generally go by the expensive pack being potentially the best (unless it's Bandori...) but you can always divide the price by the number of diamonds to get the cost per diamond. This would give you the most worth-it set to purchase. For easier comparison, a 10-roll will cost about 2000 yen (450 gems) so this is definitely a comparatively cheap game to whale on. That being said, I'm currently too jaded by idol-games to judge these prices well anymore, so take it with a pinch of salt. And last but not the least, shout-out for the special packs that are definitely a lot more worth it than the normal sets. These packs are in for a limited time only so if you feel that this game is good enough to support it financially, do keep a lookout for these! 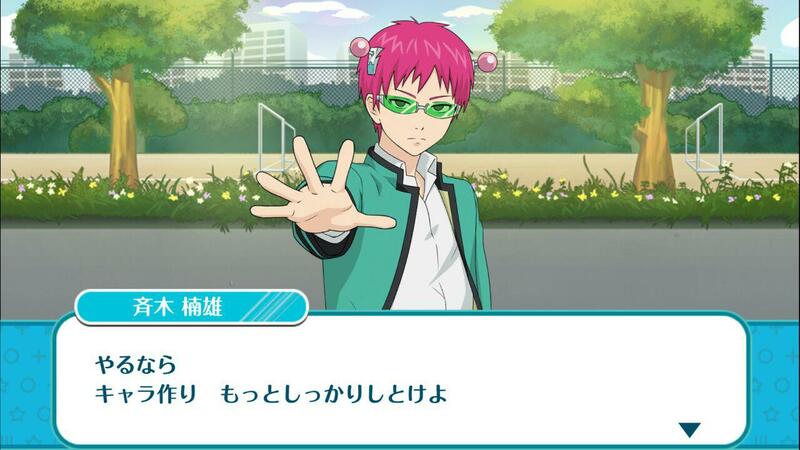 3 comments to ''「Mobage」Saiki Kusuo no Ψ-nan Mousou Bousou! Psychic Battle!" I've been googling guides in English in case they exist -- hence I stumbled on this one. I've been playing for approximately week already. As far as I know of, there doesn't seem to be a way to upgrade the base's health. I'm currently at 53rd stage still with only 2040 base health. I managed to clear Teruhashi's stages with 2 4* (blue Saiki and purple Nendou) at levels 22-25. You might want to try grinding to level up your cards and/or changing strategies. I typically use mainly air-based strategies. If you need a reference, I managed to clear it by dispatching three 4* Nendou and occasional 3* Nendou's father (every 200P in my wallet) to hold off any opponents (especially Kokomi's brother). I limit leveling my wallet to only 700P max at this point so I have at least 1 Saiki out (attack S) before the giant Kokomi appears. From then on, I just spam the above-mentioned units and Hairo while making sure to stack my strongest attacker, in this case, Saiki. 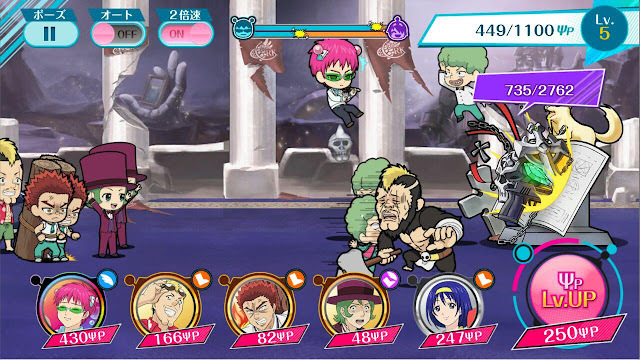 By having the air and land at the same point in the map here helps 4* Nendou to help with attacking Kokomi's brothers and thus keep Saiki alive while I'm stacking him. You may want to increase your wallet max at this point too. Once your break through the brothers, your momentum and amassed army should help clear giant Kokomi easily but of course, never stop spamming the cheap units and dispatch some stronger ones as well. Skills are also another important factor. The units I'm using have the useful skills as follows: heal own health, slow enemies down, increase own attack. Damaging all enemies can also be a useful skill.